PT Adaro Indonesia operates under a Coal Cooperation Agreement with the Government of Indonesia which gives it the right to mine coal within its Agreement Area in the Tanjung district of Kalimantan Selatan Province until the year 2022 with Rights to extend by mutual agreement are available. 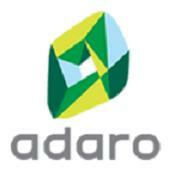 Managing training and development programs for graduates in Adaro Group. Evaluate graduate development program with committe, make an evaluation report and provide recommendation for improvements. Analyze budget that related with graduate development program and provide recommendations cost reduction efforts in oder to improve company efficiency. Organize AP Board meeting (and another meeting which related to company’s operation that involved company’s Directors), making minutes of meeting, distributing and monitoring the progress of the meeting. Help Directors to prepare 5 years plan and 1 year Plan Company’s management objective as well as do the monitoring process and reporting the progress of their plans to the BOD. Maintain external communications for corporate activities that relevant for public consumption as well as maintain and rise up company image. Education background : Undergraduate from major of : Technical / Engineering / Economy / Business Management / Business Administration and other relevant discipline that fit into the role. Working experience : 3 years working in management within established organization. Preferably has ever been working in corporate strategic planning. Ability to : listen / present in the meeting / seminar / discussion / debate and then to summarize it in concise but complete report including some details. Develop proposals and policy management system and procurement of fuel in the company in order to improve the quality of service Procurement . Collecting data to vendors / suppliers in terms of price , readiness and accuracy of delivery and quality of goods that they offer as data for selecting the vendor / supplier . Implement the selection process vendor / supplier , either directly or by appointment through the tender process to ensure the firm in cooperation with the vendors / suppliers the right to consider the quality , quantity , price and delivery accuracy . Implement and monitor the progress of the process of buying his status to ensure conformity of the specification and time . Identify , analyze and evaluate the PR process cycle time into Purchase Order ( PO ) , make a report and propose remedial actions that the PR process cycle time can be a PO in accordance with specified targets . Conduct a review and recap of purchases per month and accuracy analysis based on the budget to ensure the accuracy of the planned budget . Review and check all invoice before it is sent to the Finance and Accounting to ensure that each invoice is complete and accurate in accordance with the Standard Operating Procedure ( SOP ) applies. Having 3 years experience in Coal Mining company. Having good negotiation and communication skills. Having experience in legal and contract drafting. Fluent in English is a must. Perform management and maintain of the company legal documents (Articles of Association, agreements, licenses, stock certificates, list of shareholders), including subsidiaries that have legal implications both hardcopy and softcopy documentation to ensure that law-abiding companies and accordance with applicable policies and procedures. Do management for all working file that is being done in Legal Division, including preparing collection of documents that want to be approved when the work is done. It is to ensure that every single working have accurate information files. Making a report working files that can produce information about progress every work in Legal division. Check the validity of any legal document company to ensure a valid document in accordance with the applicable legislation. Ensuring implementation of company documentation of legal documents in accordance with the provisions and procedures of the Legal Division so that documents can be easily found if needed, recorded in a database system, controlled existence and maintained in a good condition. Documentation for implement legislation that will support the performance of the Legal Division and always update the information regarding all of the rules and regulations to ensure that all documents are documented and easily found. Carry out duties as administrator of the documentation management system for legal documents and the company’s subsidiaries and do socialization to ensure the system can be implemented in an integrated and appropriate procedures. Candidate must possess at least a Diploma, Bachelor’s Degree, Law, Business Studies/Administration/Management or equivalent. Required skill(s): Ability to work using management software documentation. Preferably Staff (non-management & non-supervisor)s specializing in Law/Legal Services or equivalent. Supporting operations for management administrative of the company and maintains schedule’s Director. Set up a schedule and organize meetings / regular meetings (weekly meetings, monthly), as well as making the minutes of meetings / conferences. Receiving, sending and making letters for the internal company and outside parties. Prepare all the needs in business trip for Directors (travel request, ticketing, visa, hotelaccomodation, transportation, travel expenses report). Candidate must possess at least a Diploma, Bachelor’s Degree, Business Studies/Administration/Management, Secretarial or equivalent. Required skill(s): ability english and korean communication skill, ability to work with detailed, ability to write correspondence well. Preferably Staff (non-management & non-supervisor)s specializing in Secretarial/Executive & Personal Assistant or equivalent. Carry out contract maintenance and inspection on a planned basis to recommended standards. Ensuring projects run smoothly and structures are completed within budget and on time. Able to work as team with another department / suction / supervisor and contractors to achieve the target. Set standards and procedures related data activity retrieval, analysis, and preparation of geotechnical recommendations so that all the recommendations issued to meet the standards and regulation in force. Plan Geotechnical investigation and identify necessary requirements to ensure the regions meets the conditions prevailing geotechnical standards and the availability of necessary data accurately. Review and design the right system for all geotechnical issues that arise on the field, including foundations, slope stability, soil improvement and other geotechnical solutions so that the availabiliity of a safe, reliable, economical can be implemented. Coordinates Development Programs for all existing employees focusing on Leadership and Managerial Competencies. Ensuring all Leadership and Managerial Competency development program for existing employees are developed & implemented as scheduled in training plan for Adaro Group. Mempersiapkan data-data dan memeriksa kelengkapan dan keabsahan bukti pengeluaran kas/bank yang dibutuhkan untuk kegiatan pembayaran keuangan. Mengelola kegiatan pembayaran keuangan perusahaan sesuai dengan rencana dan sistem/prosedur yang berlaku. Melaksanakan penginputan data pembayaran dan menyusun jurnal transaksi harian. Mempersiapkan data-data yang dibutuhkan untuk kepentingan penyusunan laporan keuangan perusahaan baik untuk internal maupun eksternal. Berkomunikasi dan mempersiapkan surat menyurat dengan pihak bank untuk memastikan transaksi keuangan perusahaan berjalan dengan lancar. Mempersiapkan data-data penunjang transaksi treasury yang akan digunakan untuk kegiatan pengelolaan keuangan perusahaan. Mempersiapkan data-data yang dibutuhkan untuk proses audit laporan keuangan yang berkaitan dengan akun-akun terkait Bank. Melaksanakan sistem dokumentasi (filling) data keuangan perusahaan yang baik dan rapi. Menyusun dan melaporkan kegiatan keuangan perusahaan kepada atasan. Min. D3 dari jurusan administrasi, sekretaris, manajemen, dan ekonomi. Posisi ini terbuka pula untuk fresh graduate. Memiliki kemampuan bekerja secara teliti dan detail. Status karyawan adalah kontrak 6 bulan. Berkoordinasi dengan departemen lain terkait pengumpulan supporting data untuk surat persetujuan, kegiatan project, laporan bulanan, triwulan, semester, dan tahunan serta inisiatif mendapatkan info peraturan-peraturan terbaru terkait kergiatan perusahaan. Memastikan laporan-laporan tersebut dibuat sesuai dengan panduan pelaporan sehingga semua lampiran kelengkapan untuk laporan sudah tersedia dengan lengkap. Melakukan input data seperti surat-menyurat dan dokumentasi lain (secara continue) ke dalam sistem yang sudah dibuat sehingga semua data-data penting dapat tersedia dalam sistem database. Melakukan update data dan dokumen secara berkala dan melakukan pemilahan dokumen untuk memastikan tersedianya data dan dokumen yang terkini serta mempermudah penulusuran dokumen serta update peraturan yang berlaku. Melakukan monitoring untuk masa berlaku seluruh perijinan dan surat-menyurat agar tidak ada yang sudah kadaluarsa. Membantu menyiapkan dan mengumpulkan data yang diperlukan tim external relation agar prosesnya bisa berjalan dengan baik dan tepat waktu. D3 jurusan administrasi, sekretaris, manajemen, ekonomi. Posisi ini terbuka untuk fresh graduate. Bisa berkomunikasi dalam bahasa inggris (lisan dan tulisan). Ensure and check the completeness and validity invoice that has been received. Perform and input all invoice bill to Finance & Accounting system, all data must complete and acurately correct. Make time schedule of payment to all suppliers to comply with the agreement that has been determined. Set up voucher payment to the cashier as bills from suppliers to make timely payment. Draft report on aging schedule, taxes, prepaid expenses, balance sheet reconciliation and accrual to A/P periodic cashflow analysis. Perform reconciliation between Ledger and A/P Vendor A/P each month to fit and there are no errors in the journal. Do the coordination with the supplier regarding the completeness of the documentation to ensure that any billing billing has been properly. Male/ Female with maximum 26 years of age. Bachelor Degree or Master Degree from Accounting or Finance. Having experience 1-2 years experience as account payable or accounting staff (preferably from public accountant and mining company). Having knowledge about making consolidation and accounting report. Having knowledge about cash management and budgeting. Having good planning, good interpersonal and communication skill with all level in organization, target oriented, and good analytical thinking. To perform personnel administration and employee/ industrial relation to ensure administration activity in accordance to comply with procedures in the company. To perform data employee records, attendance, shift, allowances, leave, training, and medical records to ensure data accurate and in timely manner. To perform recruitment process administration. To perform training program administration. To manage filing system of all HR activities and employee data. To supervise the operational activity and units in Spreader OPCC (Out of Pit Crushing and Conveying System) area activities with emphasis on safety regulations and environmental health (K3LH) for safely operation in Spreader area. To provide working instruction in operating Mobile Equipment (Stacking Area) unit, heavy equipment and ensure the procedure is in line with standard operations procedure. To provide daily operation report to ensure availability of daily operation performance. Modifying databases and products according to user needs. Providing assistance to others in topics related to data management. To prospective job applicants of Adaro Group. We hereby inform you that there are recruitment fraud being carried out using the name of PT Adaro Indonesia who contact the applicants and request money transfer to purchase ticket. PT Adaro Indonesia has never held a recruitment process in Medan and Jakarta as listed in the scam invitation letter. Pos ini dipublikasikan di Lowongan Kerja, Swasta dan tag Adaro, Adaro Indonesia, Informasi, Lowongan, Lowongan Kerja. Tandai permalink.